30 BPI CEU Package Get all 30 required CEU's in one place! 12 BPI CEU Learn the basics of building science. Great for anyone entering the home performance industry. BPI Building Analyst Online Training Learn how to perform a comprehensive energy audit and provide recommendations to save energy, improve comfort and increase a home's safety and durability. BPI Building Envelope Specialist Online Training Learn how to resolve problems related to the building shell, such as moisture, ice dams, mildew and drafts. BPI Building Analyst & Envelope Online Training Learn how to perform a comprehensive energy audit, provide work scope recommendations and resolve problems related to the building shell. BPI Multifamily Building Analyst Online Training Learn how to conduct energy audits and prepare work scope recommendations for multifamily residential buildings. 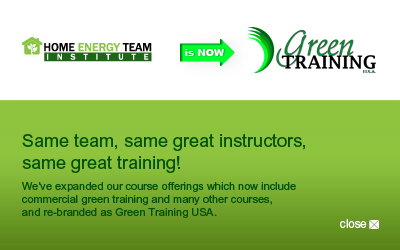 HEP Energy Auditor Online Training Set yourself apart from the rest of the pack with this advanced certification. 21 BPI CEU Get qualified to perform energy ratings for Energy Star, LEED® for Homes and various regional programs and to work with home builders and architects to design energy efficient homes. 4 BPI CEU Recognize and prevent hazards commonly found on construction sites. Residential Radon Measurement Certification Course This course prepares you to conduct radon and radon decay product measurements.